You can convert a private team to a shared team at any given time. 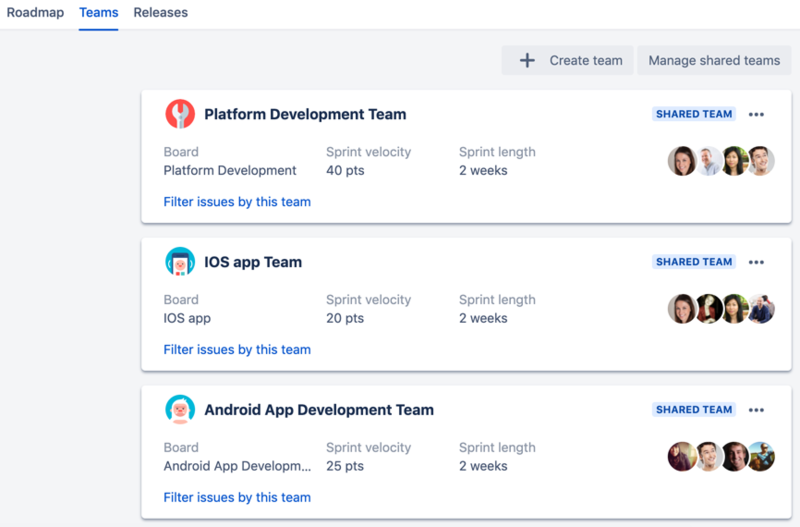 Once the team becomes a shared one, you can then assign it to issues across multiple plans. This is helpful when you already have an existing team assigned to a plan, and you want to assign the same team to another plan. Note that once a team becomes a shared team, you cannot convert it back to a private team. This is because a shared team may already be used in multiple plans, and can even be assigned work across these plans. In your plan, navigate to the teams view. The teams view will be displayed. Click more ( ) for the team you're sharing > Share. Click Share, to confirm the conversion for the team. As long as the team field is displaying in Jira issues, you can assign a team directly in the Jira issue itself. If you're currently using the team field in Jira, the assigned team will be displayed in the Jira issue itself. Click Manage shared teams to manage the details and settings of all the shared teams existing in Portfolio for Jira.